Friends I’m so excited to launch my holiday content today on the blog!! It’s hard to believe that Thanksgiving & Christmas are only a few weeks away and I’m here to get you prepped and ready have the best holiday season yet! From gift guides, to style, to advice on making the most of the season, Girl Meets Bow is going to have y’all covered from head to toe (and everything in between)! Throughout the season if you want to reference any content, just head on up to the menu bar and hover over “Holidays” and then pick what you’re looking for from the drop-down menu- easy as can be! 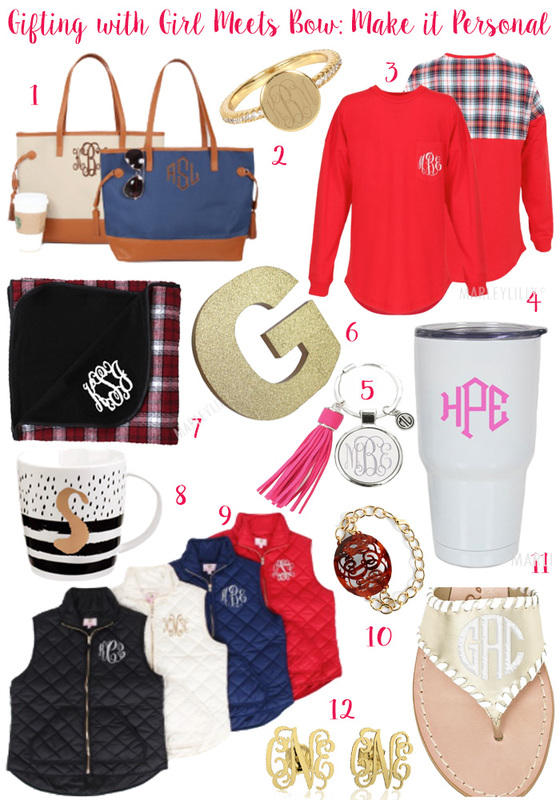 So were kicking off today with a personal favorite of mine… personalized gifts aka monogrammed heaven! 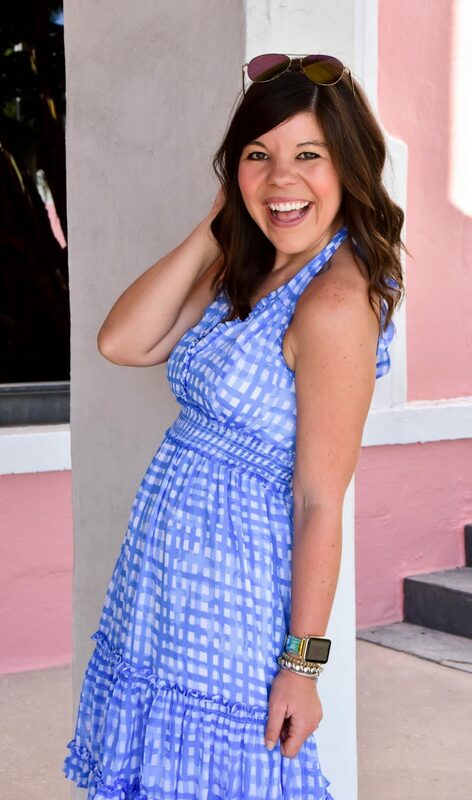 You know I live by Reese Witherspoon’s mantra, “If it isn’t moving, monogram it!” and I’ve converted many of my friends and family over to this mentality as well 🙂 There’s something so extremely thoughtful about monogrammed or personalized gifts because the receiver knows that you had to plan ahead to make it happen. I also love that it instantly makes every gift a one-of-a-kind! I can’t think of a single woman I know who doesn’t carry her whole life in her purse… so why not help her do it in (personalized) style?! There is so much room in here and the tassel detailing on the side is chic for the modern woman. My pick is the ivory color- it’s the perfect neutral shade to take you from winter into spring! Such a sweet and classic design, this ring is one of those “heritage” pieces that will be worn for many years going forward. There is no denying that “spirit jerseys” are pretty much the “it” loungewear item from the modern prep- so why gift your favorite sassy girl this cute plaid version? I know my sister (a college freshman) would LOVE this under the tree! Know a busy gal on the go? Or someone addicted to coffee (i.e: everyone I know!)? This is such a useful gift and a cute one to boot! I loved this white tumbler with the pink monogram, but you can literally mix and match any color combo to personal for your best girl! I know, I know, if you’re anything like me you already have SO many keys on your keychain. But to that I say… add one more! I think this is a great teacher gift, hostess gift, or a sweet idea for your co-workers (keep in mind I work with all women!) 🙂 At under $15 it’s budget friendly and fun! I love the idea of picking up three letters (to make your favorite gal’s monogram) and giving it as a set! How cute would this be for a young girl headed to college (#DormDecor) or even a sweet baby girl’s nursery? One of my best friends doesn’t have a middle name, so this is also a great way to personal something with just her first and last initial. Although a lot of the country is experiencing a much warmer fall than usual, there is no doubt that winter is coming friends and this is such a great, cozy gift to give! I always keep extra blankets around my house for chilly nights, or if I have guests over (I mean no one wants to share blankets- ha!). If you know someone who prefers to curl up and sip their coffee at home, why not help them do it in classic black and white style? This would make a great teacher or caregiver gift, or fill it with k-cups and gift it to your boss! You can’t turn anywhere these days without seeing a preppy girl in an excursion vest, so why not help your favorite gal stand out from the crowd in a monogrammed version? Love the sweet detailing & that the price point remains so much less than designer versions on the market! Tortoiseshell is one of my favorite jewelry neutrals since it really matches everything in your closet! This would be a great gift from a mother to a daughter- how sweet if you got matching pieces? And if tortoiseshell isn’t your thing- there are several other color choices! While this is a little bit more of an “investment” gift, if you have a palm beach gal in your life then you know this is a gift she will treasure for years! Next Post One Piece- Two Ways! I will take one of everything!! I so want a pair of monogram jacks!! So fab. Thanks for sharing, so many great picks. These gift ideas are great! Giving a monogrammed gift is always special because it shows that you actually put some thought into the gift, and that you did not just grab something last minute! Such a great idea to make gifts personal! It really makes a difference in showing that you are thinking about the recipient. Great picks, too!